Ovamo smrducka, neuobičajeno za ovo doba godine, ali najavljuju drastično poboljšanje u nedelju veče. Samo ti prati koliko će ljudi bit na dočeku njihovom za par dana bez obzira na rezultat. To će ti dovoljno reć. ivan napisao: Samo ti prati koliko će ljudi bit na dočeku njihovom za par dana bez obzira na rezultat. To će ti dovoljno reć. Gdje si ti pročitao da sam napisao da ćete biti nesretni? Rekao sam da ćete biti sjebani ako izgubite, tj. da će vam biti žao ukoliko ne pobijedite Francuze, što je i normalno. Kad si u finalu, moraš da se nadaš makar sa druge strane bio 2x jači tim... Na to sam mislio, a ne da ćete biti nesretni, nezadovoljni itd. Normalno je da ćete biti zadovoljni, ali svakako nije isti osjećaj biti prvi i biti drugi. Biti drugi znači da ti je falilo tako malo, tj. samo taj jedan korak, a pogotovo je to značajno kod najvećeg svjetskog sportskog događaja kao što je SP u fudbalu. Biti prvi je ipak nešto posebno, sigurno. A što se tiče dočeka, to svakako ne namjeravam da pratim. uhh tek sam sad došao sebi i ne mogu vjerovati!!! Jebeno finale svjetskog prvenstva! Pa ne moš vjerovat!!!! 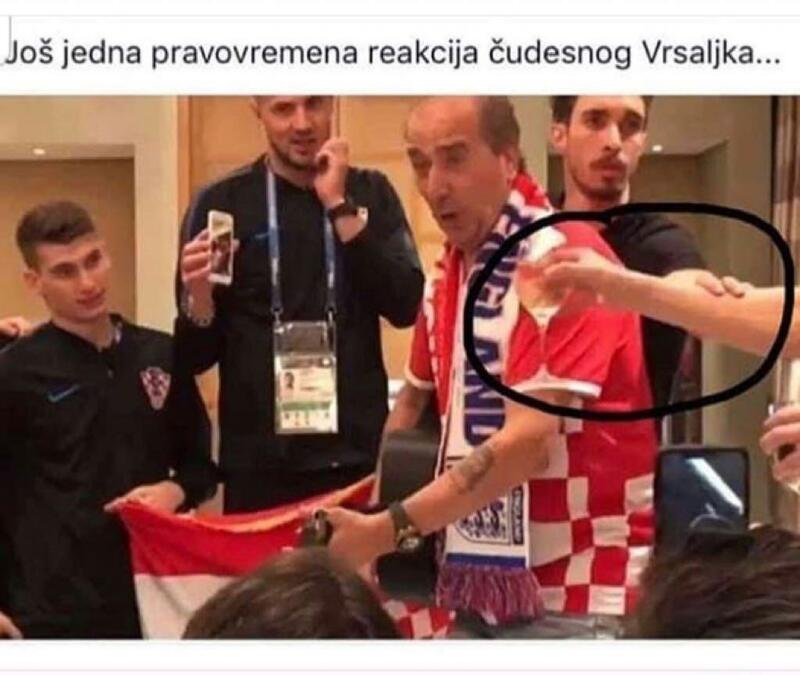 Nemam šta reć repki nego SVAKA VAM ČAST! Čovječe, pa ovo je stvarnost!!! MI SMO U FINALUUUUUUUUUUU!!! Sve na produžetke smo prošli i svaki put smo lovili zaostatak!!! Ne možeš vjerovati što se događa zadnja 2 tjedna u Rusiji! Ovakvu borbu, trud, strpljenje nikad nisam vidio u životu kod Hrvatske ni kod jednog hrvatskog kluba. Nikako se nisu predali i nisu izgubili ni jednog trenutka kompas već su svaki put lovili rezultat, vraćali se i na kraju slavili. ZATO SMO TU GDJE JESMO! Bože hvala ti na još jednom velikom povijesnom trenutku, a bilo ih je u zadnjih 29 godina. Srce i dusa od ponosa i Hrvatstva boli! The old man took his cattle up the hill that morning in December 1991, because that’s what he did every day, rain or shine, winter or summer. He took his cattle up the hill that morning, and he never came back. A handful of men in police uniforms arrested him. Whether or not they were legally police officers was moot, and it was also irrelevant: round these parts, power came from the barrel of a gun, not from a piece of paper. The man’s crime was the same crime it always is in places riven by sectarianism: not being one of them. Being the other. Being the enemy. His crime was nothing he’d done: it was who he was. He was Croatian, they were Serbian. That was all there was to it. The men took him and a few others to the nearby village of Jesenice, and there they were executed. The old man left behind a family whom he loved and who loved him: none more so than his six-year-old grandson with whom he shared a name and from whom he had been practically inseparable, the old man doting on the boy, the boy hero-worshipping his grandfather. The name they shared was Luka Modric, and this Sunday that small boy, now 32, will lead his country out in the World Cup Final. Football uses the language of war: strikes, shots, volleys, attacks, defence, bombardment. Modric, like all his countrymen, knows the difference between the real thing and the game: knows too that in Croatia one is always bound up with the other, because between them they are the history of that small, proud nation writ large. After his grandfather was murdered, Luka’s family’s house was burned down, and they had to live in a hotel for years: not an expensive comfortable one, but a basic, crumbling one in their hometown of Zadar. When the mortars fell, as they often did, young Luka would sit inside and wait them out: but when the all clear was given, he’d be off playing football in the hotel car park, sometimes with other kids, sometimes on his own. Anything to escape the grim, numbing reality of living in a perpetual state of conflict. He was a small kid: too small, as it turned out, to be taken on by the local bigwigs Hadjuk Split. He ended up playing aged 18 in the Bosnian league for Zrinjski Mostar, which was where both team-mates and opponents discovered two things about this kid: that he had all the skills you could want, and that he could look after himself too. Fast forward 15 years, through a journey that has taken him from Dinamo Zagreb via Tottenham Hotspur to Real Madrid. Even though he still looks like, in the unimprovable words of the Guardian’s Barney Ronay, ‘a little boy dressed as a witch’, he is now one of the best players in the world: a midfielder of fabulous talents, one of the very few who can bend time and space to his will. And of all those talents, perhaps the greatest is this: that he makes others play better. When the simple pass is the best option, that’s what he plays. When he needs to hold the ball for a few moments so his team-mates can get into better positions, that’s what he does. When he has to cover back after someone else’s mistake, that’s what he does. He’s not one of those superstars whose megawattage draws the eye and the play too, whose own presence inhibits the other ten men wearing the same shirt as him. He’s the ultimate leader precisely because he doesn’t make it all about himself. You won’t find him rolling around as though he’s just stepped on a landmine, or ripping his shirt off when he scores, or standing there looking haunted when things aren’t going his way. He leaves that kind of stuff to Neymar, to Ronaldo, to Messi. They’re all home already. He’s still there, and so are his team. And his team love him. When he missed a penalty late in the match against Denmark, his team-mate Ivan Rakitic gathered the others round. 'Listen,' he said. 'Lukita's got us out of more messes than we can count. It's our turn to repay him.' The Croatians put the miss behind them and won the subsequent shoot-out, with Rakitic slotting the winning kick. But if you want to know what Modric is made of, here it is: only a few minutes after missing that penalty, he'd taken another one in the shoot-out, with the Danish keeper Kaspar Schmiechel in his face trying to put him off. Did he score second time round? Of course he did. It’s hard to understand – no, it’s easy to understand, but hard to properly FEEL – what this Croatian side mean to their country. The most famous image in English football history is that of Bobby Moore lifting the World Cup. The most famous image in Croatian football history, by contrast, is that of Zvonimir Boban taking a flying kick at a riot policeman. Boban was sacked from the Yugoslavia team who went to the World Cup that year. He didn’t care. In his own mind he was Croatian, not Yugoslavian, and eight years later he captained Croatia to third place in their very first World Cup. He was leader of a generation of fabulous players - Slaven Bilic, Robert Prosinecki, Davor Suker - who to this day are revered in their country. In reaching the final, Modric’s men have already gone one better than their predecessors. It’s fitting that they’re playing France: both sides have played three group matches and three knockouts, with Croatia the stars of the group stage and France the best team in the knockouts. The smart money has to be on France. They are a better team overall, and they have won all their knockout matches in normal time where Croatia have been taken to three consecutive extra times: an additional 90 minutes of football, the equivalent of an entire match more. My head says a French victory, perhaps even an easy one. But my heart says a Croatian win, for the fairytale of the underdogs, for a proud people forged in war, and most of all for their remarkable captain and the old man after whom he was named. Zadnja izmjena: anton 1983; 13 srp 2018, 09:59; ukupno mijenjano 1 put/a. anton 1983 napisao: Al osječaj je fenomenalan! Osjećaj puke sreće, ono kad jednostavno kliziš kroz život. Kad su ti svi drugi "problemi" nebitni jer te ispunjava neka unutarnja sreća i nitko ti ništa ne može.